Whom is the Navy Birthday intended to honor? We have Navy Day later in October, as well as Navy Weeks, Fleet Weeks. They're fun, informative and patriotic, for sure, but those are public relations events. So, then, is today's Navy Birthday a private party for those on active duty? I took off my uniform long ago. I'm not even retired. Do I get to celebrate? ... our ships, submarines and aircraft form the muscle and bones of the Navy, but the heart and soul of our Navy is you, our people. Who is this "you"? Who are "our people"? To all our Sailors, Navy civilians, proud families and Veterans around the globe, Happy Birthday and thank you for your service. The Navy Birthday is for all of us. It's for all who serve, for those who have served and for those who have supported us. It's for all of us. What Navy band video do you think is the most popular on YouTube? A U.S Navy Band concert band performance on the Capitol Steps? A swinging performance by the Commodores? Nope. The Most-watched Navy Band Video award goes to Seventh Fleet Band. Their rendition of "When the Saints Go Marching In" has scored nearly 200,000 views. Granted, the video's been attracting viewers for five years. But even the Commodores's most popular video, "Sing, Sing, Sing," has logged only 25,000 views in eight years. So, in my opinion: Hail to the fleet! Truman Capote claimed he didn't take notes during interviews because he had nearly absolute recall of conversations. I will make a lesser claim. I can accurately recreate conversations if I make notes soon after and transcribe the conversation in full within a few hours. As a newspaper columnist, I often have to do this. The results are "verbatims," accurately recorded conversations that have been only barely edited for clarity. Frank is sitting in the passenger seat of the Holiday Inn van on the way to the airport after the 2015 NMA reunion when the driver asks a question. Driver: So, you were with those Navy guys? Frank: Yes. We had a great time. Driver: I thought so. There was this guy smoking a cigar out front of the hotel; coupla the other guys told me he was trouble. Frank: Lots of those old guys are trouble. Driver: They said you musician guys aren’t having fun unless the shore patrol has to come and break it up. Said that guy with the cigar was the ringleader. Frank: The guy with the cigar—was he a big guy? Driver: Real big. Wish I could remember his name; Jerry, something like that. Driver: That’s the guy! Wooeee, he’s big. Bet he’d cause a lot of trouble. This is my last night in Virginia Beach. I'll fly home tomorrow, taking with me a seabag full of memories. What this means is I won't be online for a few days. I'll hope to post more pix and maybe some video over the next week or so. But you know how post-reunion life really is: all your regular responsibilities jump out of the bushes and demand your attention. This reunion will stay in the mind and heart for a while; see you in a few days. 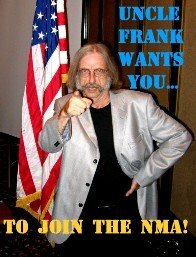 The NMA is not the old School of Music. Players don't ascend through "A," "B" or "C" bands. All are welcome to play in all our ensembles. Many members are concerned about the possible repercussions of Terry's performance with the concert band this year. In rehearsal and in concert, Terry played in an exciting, contemporary arrangement of "Swing Low, Sweet Chariot" that required improvisation on the alto saxophone. Their worries are based on the typical "slippery slope" argument, which goes like this: Let someone play a little sax jazz solo with the concert band and the next thing you know, he'll be flitting into rehearsal in a sequined jumpsuit carrying a B-flat clarinet, demanding to be featured in an arrangement of "Stranger on the Shore" with glitter shooting out of the bell of his Selmer. Friends, you need not worry. Concert band conductor Wilbur Smith assures us that Terry's performance was a needs-based exception. He was granted a one-timem non-renewable "Provisional Concert Band Membership" that expired Friday night immediately upon the conclusion of "Armed Forces Salute." I trust Wilbur and won't lose any sleep over this. If you're the worrisome sort, there's nothing I can do about that. We remember the good times and the not-so-good times. We share laughter in the lounge when a sea story evokes a memory of the friends we found in the Navy and shed tears in the ballroom when the Navy Hymn reminds us of those we have lost. The NMA concert band's first rehearsal is often, shall we say, shaky. Many members haven't arrived yet, leaving half the chairs empty. This year, the rehearsal hall was packed on Day One, giving us, in essence, an extra rehearsal. By show time on Friday night, this band was in top form. Preparation and enthusiasm were also key to the success of our dance band. On Tuesday night, rehearsal director John Branham organized a working party to set up the hall for our first morning rehearsal. As a result, the band didn't have to spend half the morning juggling music stands and rhythm section gear. It was almost like having an extra rehearsal. Even here at the Holiday Inn, our "home port," schedules can go awry. Since our last reunion, the hotel has had a change of management, a factor that, in the past, has thrown the occasional snafu or two into the schedule. But this year, we never had to scuffle through last-minute schedule-juggling. Our reunion planner, Bob Leketa had clearly done his work. I hate to say this, but I almost missed watching Bob storming around the hotel saying, "I gotta put out another fire." He actually looked like he was enjoying himself. We all did. And much of this was due to preparation. And, of course, much was due to the success of the first rehearsal; rehearsals really are more effective when the players are actually there. The 20th Anniversary reunion of the Navy Musicians Association is now history. I said my last goodbyes in the lounge around midnight, hit the rack, woke up at 8:30, said "No way,: rolled over and slept for another three hours. I'm about to tour the building; there are generally a few people still around the day after the reunion. But the party is over, the memories settling into place. And I'll share some of them with you in a few hours. Meanwhile, there must be coffee around here someplace. What a night. What a blast. What a reunion. We've just wrapped up the dance. I'm changing clothes and running back downstairs to the lounge. We said official goodbyes in the ballroom, but it's not over until it's over. And it ends in the lounge. I'm spending an extra day--Sunday--here at the Holiday Inn, to wrap things up and catch my breath. So I'll have more time for after action reports, photos, maybe some video. But right now, I think I hear a quartet playing "The Party's Over." And so are you, if you attend next year's Navy Musicians Association reunion. At today's General Membership meeting, Executive Vice-president Bob Lekata announced plans to hold the 2016 reunion in Kansas City, Missouri. The details have yet to be worked out; Bob will travel to KC to line up the most appropriate hotel for our needs. This will take some negotiating, but that's what Bob does. When the details--which hotel, which dates--are worked out, they'll be posted here and at the NMA's website. Kansas City sounds good to me. We've spent a few years in Virginia Beach and it's time to travel. Kansas City is a more-convenient location for members who usually have to travel long distances for our reunions. Personally, I love this. I live in western Illinois and it'll be nice to drive to a reunion in one day. Take a look at the online roster on the NMA website, and you'll see the Midwest is full of MUs. And, to me, Kansas City equals Count Basie. After the concert last night, the dance band played. Then we moved to the lounge. Our new active duty members joined in the jam session. They're younger than I am and stayed later than I did. Did I mention that among other things, an NMA reunion is a party? Good morning, or whatever this is. It's happened to me before, so I know I'll survive it. Especially because I know where the coffee is: we're having a light breakfast in the ballroom prior to the General Membership Meeting. This is a members-only meeting. We'll elect officers, hear reports, solicit questions and suggestions. And we'll find out where we'll hold our reunion next year. We've been discussing holding a reunion more accessible to members who, like me, live in the middle of the country, perhaps the Midwest. Maybe 2016 will be the year I can drive to the reunion in one day. Friday is the most frantic, busy and rewarding day of an NMA reunion. We start the day with an excursion. This year, we were guests at a Naval School of Music Basic Course graduation ceremony. The speaker was our president, Terry Chesson. Following graduation, we toured the newly-renovated school. After lunch, the concert band had a long, productive rehearsal. After a bit of down time we returned for the concert. I was amazed at how well it turned out. I'll have more to say later, but right now, I think it's safe to say this was the band's finest hour. Then dance band. Then a jam session. And now it's the bedtime hour. Yes, an NMA reunion is a chance to renew old acquaintances and meet new friends. And, yes, an NMA reunion is an occasion to remember our heritage of service. As we toured the School of Music this morning, I took a moment to recall fond memories of my parking space. It's been taken over by someone else, the first sergeant, perhaps, but for years it was mine. In 1980, I was chosen Staff Member of the Quarter, and deservedly so, I believe. The prize was a parking spot right in front of the building. It was a great perk for those of us who screeched into the staff parking lot ten seconds before morning colors. Later in the year, I was upgraded to Staff Member of the Year, and again, deservedly so. The signage on my parking spot was upgraded to reflect my elevated status. Then, the powers that be forgot about the this-and-that of the year, and the award was discontinued. Therefore, until I transferred a few years later, I kept parking in my royal parking spot, to the great chagrin of the Navy, Marine and Army staff that resented my glory. They were keeping their eyes on me. We got back from our trip to the School of Music in time for lunch before concert band rehearsal. And also in time to do what we do so well: Hang out. In other words, lie to each other. We spent the morning at the Naval School of Music. The facility has been entirely renovated, but much is still recognizable. Marines are, of course, recognizable, and there are plenty of them to go around. ...and to remember old friends. I'ts 0630 and I'm getting ready to hop on the bus to visit the School of Music--if "hopping" can be used to describe my mobility at this hour. A lot of former military people have told me that active duty taught them a lifetime lesson in getting up early. I failed this lesson. If I had my way, I'd be in bed every morning until noon broke over the horizon. But I'm on the 0700 bus; there are two busloads and I got assigned to the early one. This will make for a long day. The NMA now has an official rock band, which rehearses at 1130. The last concert band rehearsal is in the afternoon, the performance tonight, then more fun in the lounge. This photo is out of focus, indistinct and my favorite so far. Wilbur Smith put the concert band to work today; long, detailed, productive work. We're here for fun and camaraderie, but we take our music seriously. We want to do our best, given the brief time we spend together. So Smitty worked the band hard, along with Ray Ascione and Peter Graves, who are helping with the conducting duties. Smitty, of course, knew that only one Friday afternoon rehearsal remains. And there's much more to do; like any Navy band, we have reliable patriotic and military standards that need to be thrown into the mix. But the bulk of the work is done. As an old MU carried his horn out of the rehearsal hall after rehearsal, I said, "Boy, you had a real workout this afternoon." "Yeah, he said, "but that's why we came here." It's the second day of the NMA reunion and members are still filing in. Shortly before noon, Ben McHorney checked in. Ben, a long-time member, is a regular reunion attendee. The key to Navy success was simple: show up in the right place at the right time in the right uniform. All you had to do was check the scedule. Your bus ticket is numbered. The rehearsal board by the registration room will tell you which bus to take. A few more words about the concert band. We're a mixture. We are full-time performers. We're part-timers. We are educators. We are former MUs who who have returned to playing horns that sat in the closet for decades. So, as you might imagine, the first rehearsal of at an NMA reunion is often, shall we say, tentative. We haven't played together in a year; some are joining us for the first time. We're sight reading new material. We're trying to create a cohesive sound. And we're not all here yet; travel plans and scheduling needs often conspire to give us only half a band on Day One. Yesterday's first rehearsal was, however, atypical. One thing you didn't see in the rehearsal hall today was empty chairs. Attendance is up for this 20th anniversary reunion, so we had a full house. And what a difference it made. Our sound was big, sometimes too big. Our conductors were in the unusual position of having to quiet the band down on the first day, rather than try to pull a full sound out of the group. More players showed up after rehearsal yesterday. So, today we'll face a new problem: where to put them all. It was something nobody expected to ever see, but there it was: President Terry Chesson playing in the concert band. Another volunteer working party pitched in over the lunch hour and the 1330 rehearsal started--get this--early. Often our first get-together is shaky due to incomplete attendance; in short, everyone hasn't arrived yet. But today, the rehearsal hall was packed even before downbeat, and more players continued to arrive through the afternoon. This is the NMA's 20th anniversary this year. Our director, Wilbur Smith, has ensured that our program will honor this important event with patriotic favorites as well as new music written for this occasion. And Ray Ascione has again agreed to conduct some of the concert. Ray was the leader of the Naval Academy Band. I heartily endorse this decision; anyone who's good enough to conduct the Naval Academy Band is good enough to lead the NMA concert band.